You need to use professional-looking accessories in decorating your booth at any expo or trade show. High-quality decor will not just make your booth look pretty. They serve as advertising tools for your products and services, and they give your company more credibility. Retractable banner stands are just one type of booth decoration you can use; affordable retractable banners are among the many expo accessories we offer. Our retractable banner stands are definitely eye-candy. You can use them to decorate your booth at an expo or trade show, as well as to advertise your products and services at shopping centres or at events your company is sponsoring. 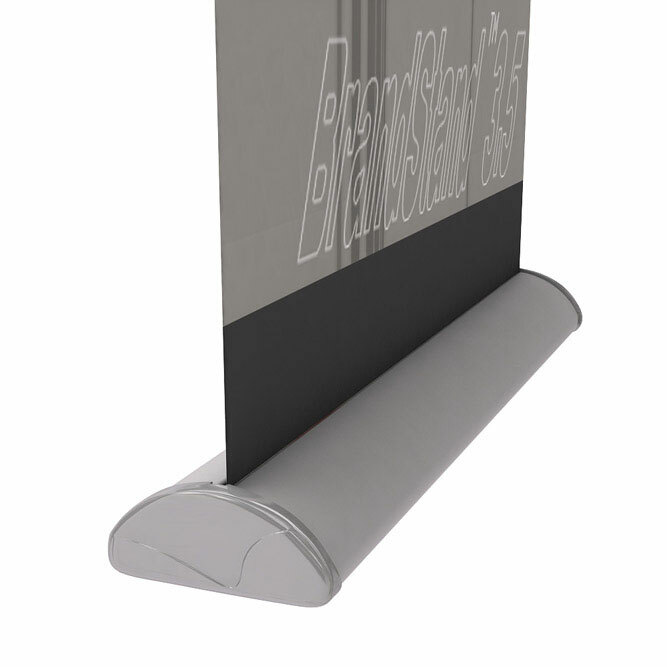 Each retractable banner set we have is composed of aluminium hardware and a fabric graphic. The hardware can be finished in black or in silver for an elegant, distinguished look. The fabric graphic, however, is the jewel of this banner set. It is printed using dye sublimation, the most colour-accurate fabric printing technology available in the market today. In dye sublimation, high levels of heat and pressure are used to make ink transform from solid state directly to gaseous state. When the ink is in its gas form, it permeates the fibres of the fabric to create a permanent impression of the image onto the fabric. So, the resulting printout is not only permanent but also highly resistant to fading and damage. And because the banners are made of fabric, you can reasonably expect it to last without easily succumbing to wearing and tearing. Fabric makes for a good curl-free banner because it is better than other materials such as paper, PVC or vinyl. Unlike these materials, fabric doesn’t wilt or crumble irreparably out of form even when exposed to sunlight, changing temperatures and such. It is durable and, therefore, it lasts. Aside from being pretty to look at, these retractable banners are also easy to install. It only takes three minutes flat to put together this display. All you need to do is to slide its feet so they are positioned perpendicularly to the base. Then, you unfold its centre pole, lock it at its joints, and attach it to the base so it stands upright. Once the centre pole is attached, you pull the fabric banner from the base and hook it to the top end of the centre pole. You can order these fabric banners double-sided for maximum exposure, and you can install one or a pair of halogen lamps on top of the centre pole to spotlight your display. As mentioned earlier, the fabric making up this banner stand is curl-free and processed using dye sublimation printing. This means you can use this banner for as long as you want, and for different types of events as well. It comes with a carry bag so you can transport it easily to any location. And if you need a new fabric banner, you don’t need to order an entirely new set altogether. You can simply keep the hardware and order a new fabric graphic. Our pull up banner stands are an ideal solution for your display needs. We deliver to any location in Australia, including Sydney, Melbourne, Canberra, Adelaide, Gold Coast, Darwin, Perth and Brisbane. Call us for more information about these fabric banners today.